President Enrique Garcia de Castro underlined in his opening speech the importance of unity and standing together for the good of the sport. All IFAF European national member federa-tions are invited to become actively involved in the life of IFAF Europe CA. There is only one home of European Football - and that is IFAF Europe CA. MC members applauded warmly and welcomed his inspiring speech. President Garcia de Castro reported that IFAF Europe CA after its foundation set up it working structure pretty fast. The registration with the authorities is done and the statutes are now in force. IFAF Europe as continental association of IFAF in Europe is the only authority in charge to oversee American Football in Europe. IFAF Europe was established by a joint majority decision of 23 out of 40 IFAF European national federation members on September 17, 2016 in Paris and therefore speaks for the overwhelming majority of national federations in Europe. Looking on the membership numbers those 23 national federations represent close to 80% of all indi-vidual members as well as clubs in Europe. Therefore IFAF Europe CA has the aim - and the duty - to unite all American Football activities in Europe under its umbrella - to protect the sport and to ensure proper exchange between the nations for the good of the sport. The MC discussed and decided about the reports of Sports-Director Romeo Tjoe-A-On on the upcoming European U19 Championships 2017 in Paris (France) and beyond, the European Championships A-Group 2018 in Germany as well as the qualifying tournament to those events. Big6 EFL, EFL and Atlantic Cup Management reported about the set-up of this season’s com-petitions. With defending EUROBOWL Champion New Yorker Lions (Braunschweig), Amster-dam Crusaders, Badalona Dracs, Berlin Rebels, Samsung Frankfurt Universe and Milano Seamen six well-known and high ranked teams will participate in the Big EFL as Europe’s Premium league. Berlin Adler, Milano Rhinos, Dauphine de Nice, Prague Black Panthers and Thonon-les-Bains Black Panthers will compete in the European Football League (EFL). The Atlantic Cup will be played with four more teams in September in Dublin. IFAF Europe Champions League is still under review and discussion. IFAF Europe CA as governing body of American Football in Europe is now accepting sanction-ing request from member federation and/ or clubs for cross-border pan-European games, competitions and tournaments. The MC endorses to all the member bodies to not accept any national team or club competition on European soil, which is not sanctioned by IFAF Europe. IFAF Europe as continental association of IFAF in Europe is the only authority in charge to oversee American Football in Europe. MC further discussed the future organization of the European Championships Flag Seniors to be held in 2017 and the potential organization of European Championships for Female Tackle. The MC welcomed the initiative of the IFAF Presidium to launch Beach Football as new sport discipline under the umbrella of IFAF. That project has the potential to allow all IFAF member federation to compete in a World Championship and not only a very few number of higher de-veloped countries as currently in tackle. With regard of IFAF World Championships the MC expressed its dissatisfaction with the cur-rent format. The concept of expanding the World Championships tackle by the number of par-ticipants with up to twelve teams and of awarding the events to places where neither is a well-developed local football structure nor a high number of spectators does not help the develop-ment of American Football. More or less it destroys the achievements done in the past since the foundation of IFAF. Therefore the MC recommends to IFAF to return to small tournaments with fewer participants. The MC also appointed the first members of committees and staff. 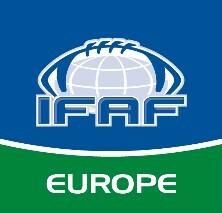 For the European games of the 2017 season IFAF Europe will work with a provisional list of officials based on those officials, which had been on the European list of IFAF Europe CA´s predecessors and/ or nominated by the member federations while the officiating department will work jointly with the members federation on new criteria for the future. The first officiating clinic will be conducted in the offseason 2017/ 2018.